WINNIPEG, LETHBRIDGE and BRANDON — The University of Winnipeg, University of Lethbridge and Brandon University have come together to create an extraordinary opportunity for their students and communities, partnering to present U.S. intelligence officer and whistleblower Edward Snowden in a special live conversation via web-link from Russia, where he is currently living with asylum status. He will be addressing mass surveillance and the role of higher education in engaging the ethics of mass surveillance. Noteworthy and newsworthy, Edward Snowden rose to prominence when he revealed the scope of American intelligence agency surveillance. The lecture event takes place Tuesday, May 9, 2017 at 6 p.m. CDT (5 p.m. MDT) and will consist of a one-hour presentation by Snowden and feature a question-and-answer segment from select audience members at all three participating universities. Snowden, a United States citizen, is a former intelligence officer who served the CIA, NSA and DIA for nearly a decade as a subject matter expert on technology and cybersecurity. In 2013, he revealed that the NSA was seizing the private records of billions of individuals who had not been suspected of any wrongdoing, resulting in the most significant reforms to US surveillance policy since 1978. He has received awards for courage, integrity and public service, and was named the top global thinker of 2013 by Foreign Policy magazine. Today, he works on methods of enforcing human rights through the application and development of new technologies. He joined the board of Freedom of the Press Foundation in February 2014. “Edward Snowden is one of the defining figures of the decade. This is an incredible opportunity for people in Lethbridge to hear directly from him,” says Dr. Harold Jansen, a U of L political science professor and moderator for the local event in Lethbridge. The three universities seized upon the opportunity to collaborate and bring Snowden to their respective communities, recognizing the significance of the security issues he will address and seeing the chance to engage further conversation. “Universities are built on collaboration and we are pleased to work with our colleagues in Winnipeg and Lethbridge to bring this important discussion to a wider audience,” said Dr. Steve Robinson, Brandon University’s Vice-President (Academic & Provost), who arranged the Brandon link. 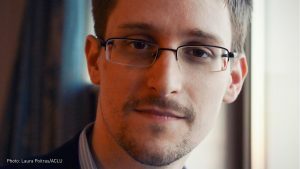 For The University of Winnipeg, the Snowden event is part of its annual Axworthy Distinguished Lectures Series. In Winnipeg limited seating is available to the public on a first come basis. The University of Lethbridge, also celebrating its 50th anniversary, is utilizing the lecture as a showcase event for the recent launch of its School of Liberal Education, highlighting the need for critical thinking and evidence-based reasoning to address complex world issues. Brandon University, marking its 117th year as an institution and 50th anniversary of receiving its university charter, is embracing the event as a way to deepen campus–community engagement, a cornerstone of the BU Academic Plan.